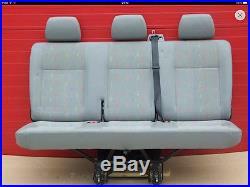 This advert is for seat covers for a three seater triple bench as shown in the first image of a VW transporter T5 van. Bench is shown in the first image and the seat cover design are shown on the subsequent images. A detailed information about fabric / washing / compatibility with heated seats etc is given in the FAQs section (we would recommend that you read the section for more information). Fitting Style - Made to Measure. Dispatch Time : Unless specified other in the top lines of description. Fabric Information: Fabric Information: Thick quilted PVC leather. The same thick cover goes right down the the backing as well. How many days before you dispatch the item? I do not want a loose or a baggie fitting seat cover, will they be a good fit. What information do you need from me to make a fully fitted seat cover from my van? This seat cover will be a tight fit as shown in the images. / What fabric is this? / Can it be washed? This seat cover is waterproof. How do I clean the seat covers? The seat cover can be sponge cleaned using a mild shampoo / cleansing agent. How do I know if the fabric is right for my use? How do you post your items? Why W e Recommend Tailored Fit When you shop online for protective seat covers, fitting style is very important because- Functionality: Over all make of the seat cover is important- A universal one piece seat cover which goes over the head rest and complete seat in one go will be equally good with the protection (assuming that the fabric used is good) but when it comes to long term usage and being able to use all the various features storage/ coffee table/ adjustable head rest / arm rest covers etc on your van seats a universal seat cover may not be desirable. We only make custom fit seat covers which means there will be a provision for coffee table, arm rest opening and , storage etc using zips, velcro and stiched openings. Comfort : Universal one piece design which goes over the head rest and complete seat in one go may start to loosen over a period of time (owing to the fact that every time you sit on it the seat cover is pulled from top to bottom), where as making them with separate head rest head rests allows the body weight to be equally spread over individual seat cover. Each part of your OEM seat is individually covered. Alternatively you may pick from a range of colour options. The item "PREMIUM PADDED VW TRANSPORTER T5 VAN SEAT COVER TRIPLE BENCH 120BK" is in sale since Friday, June 16, 2017. 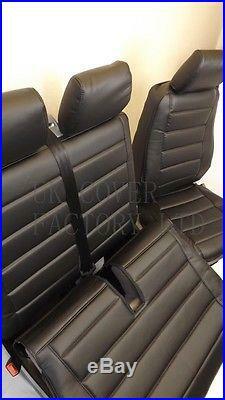 This item is in the category "Vehicle Parts & Accessories\Car Accessories\Interior\Seat Covers & Cushions". The seller is "made2measurecovers" and is located in Manchester, Lancashire. This item can be shipped to United Kingdom, Austria, Belgium, Bulgaria, Croatia, Cyprus, Czech republic, Denmark, Estonia, Finland, France, Germany, Greece, Hungary, Ireland, Italy, Latvia, Lithuania, Luxembourg, Malta, Netherlands, Poland, Portugal, Romania, Slovakia, Slovenia, Spain, Sweden, Australia, United States, Canada, Brazil, Japan, New Zealand, Israel, Hong Kong, Norway, Indonesia, Malaysia, Mexico, Singapore, South Korea, Switzerland, Taiwan, Thailand, Chile.